Young Mike Wazowski (Billy Crystal) wants to go to Monsters University to become a scarer, but in contrast to big beast Sulley (John Goodman) he's not at all terrifying. If only he could win the Scare Games… Though not as genial as former Pixar movies or the first film („Monsters, Inc.“), still a great and entertaining film for the whole family. 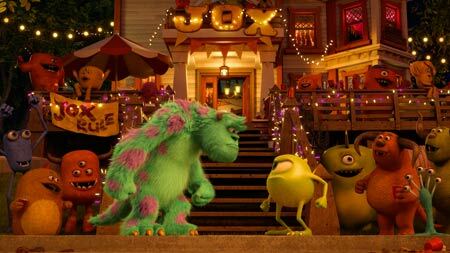 Michael „Mike“ Wazowski (Billy Crystal) is a small, green monster with a cyclops' eye and two tiny horns. With his school class he goes on an excursion to the Monsters Inc. factory where the most horrifying scarers terrify children from the human world to harvest energy for the monster world. Mike can watch his heroes do their work – even at the closest range. Although nobody finds Mike to be even the tiniest bit scary, he has set his mind on becoming a professional scarer. 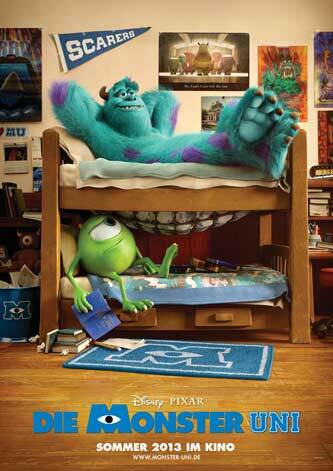 More than 11 years ago „Monsters, Inc.“ enthralled young and grown-up audiences world-wide with its reversal of the monster perspective, because in Pixar's fourth feature the monstrous protagonists were endearing and cuddly characters. And it is still amongst the top 10 of the most successful animated films. This is reason enough to produce a new instalment with the beloved monsters and not release it directly on DVD – as is done quite often with sequels to alleged children's films – but to release it theatrically. For this second instalment Pixar decided to make a prequel for the first time and introduce some background. This has been a very good decision. 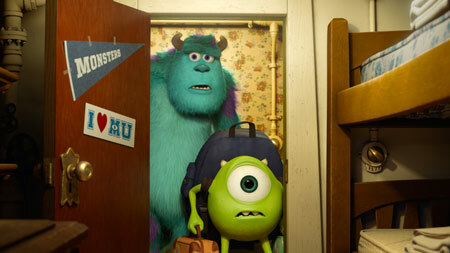 They could have come up with new adventures of Sulley and Mike, but „Monsters University“ has many advantages with its back story: the audience gets to know their darlings yet a bit better and additionally the university context offers a surrounding rich in variety and virtually unseen in an animation feature. Pixar release a new animation film almost every year and with only a very few exception these have been on the most ingenious level, be it "Up", "Wall-E" or "Finding Nemo". Even if director Dan Scanlon (storyboard artist for "Cars") and his two screenwriting colleagues Robert L. Baird and Daniel Gerson (both „Monsters, Inc.“) didn't succeed in the biggest strike in Pixar's body of work, it is still an extremely solid piece of family entertainment. Probably it's complaining on a high level, because the expectations from Pixar are unreasonably high (but they've let themselves in for it). 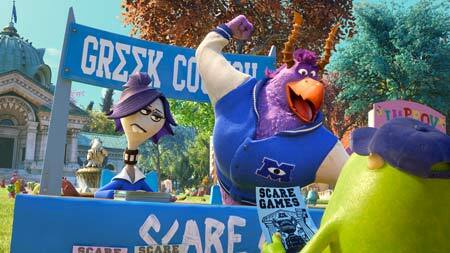 As a matter of fact, „Monsters University“ still stands out amongst the many worse animated movies of other studios. Still the filmmakers could have got more out of the university theme. But fear not: the film is certainly funny, enjoyable, colourful and powerful. 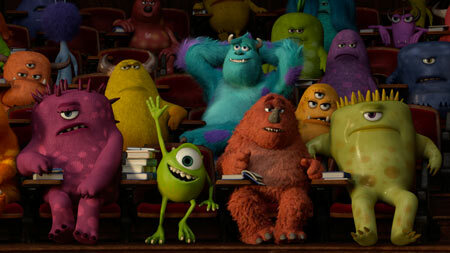 And those of you who want to go and see „Monsters University“ can do no wrong. The voice-over artists for the main characters are again Billy Crystal („When Harry Met Sally“), John Goodman („Roseanne“, „Argo“) and Steve Buscemi („Fargo“, „30 Rock“). 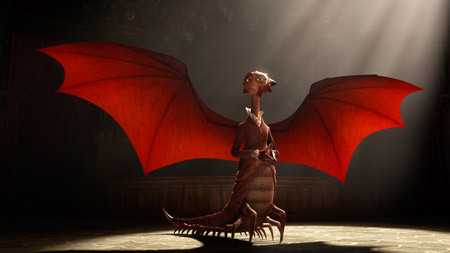 New voice cast are Helen Mirren („The Queen“), Alfred Molina („Chocolat“) and Charlie Day („Horrible Bosses“).